A strong, quiet man and lifelong servant of his God, his family and his country, Michael Eugene Ruth was taken from us on May 7, 2018 to be reunited with his worldly and heavenly fathers, the result of pancreatic cancer. Mike was born on November 4, 1953 in San Diego, Calif., into a loving and nurturing family of patriots. Most of his ancestors served their families and friends as teachers, in the medical professions, the clergy or the military. By 5 years old he had developed a passion for airplanes and had set his sights on a career as an air force pilot, following in his father’s footsteps. His youth was spent in various locations throughout the U.S. on and near air force bases in Florida, Texas, Nevada, New York, North Dakota, and California. He also spent a couple of exciting years attending grammar school in England. In all these places he enjoyed a freedom of exploration of nature and geography and, as the oldest of five siblings, always embraced the leadership role. While not the avid reader of history he became later in life, he always relished listening to the “war” stories of friends and family at frequent gatherings of both. From the artillerist of the Civil War (great-great grandfather) to two career naval officers in W.W.I and W.W.II (grandfathers), marines in Korea and Vietnam (uncles) and fighter pilot in Vietnam (father) he was immersed in the traditions of camaraderie and service which served him well in his own life journey. Mike applied for and received an appointment to the United States Air Force Academy at Colorado Springs, Colo., during his senior year of high school and joined the Class of 1975 “Best Alive” on 5 July 1971. After graduation with a Bachelor of Science degree in Civil Engineering he was commissioned a Second Lieutenant in the U.S. Air Force and went on to pilot training at Webb Air Force Base in Big Spring, Texas, flying T-37 and T-38 aircraft. The next 12 years of his career was spent training for or operational flying assignment in: the A7D Corsair at Davis-Montham AFB, Ariz., and England AFB, La. ; the OV-10A Bronco at Patrick AFB, Fla., and Sembach AB, West Germany; and the F-16A/B Falcon at Shaw AFB, S.C., Kunsan AB, Republic of Korea and MacDill AFB, Fla. Following a year at Quantico Marine Base, Va., completing Marine Command and Staff College, he served out the remaining time of a 25-year Air Force career in staff positions at Headquarters Tactical Air Command Langley AFB, Va., and North American Air Defense Command (NORAD) in Colorado Springs, Colo. Following his very fulfilling air force career Mike spent the next 2 years as a commercial airline pilot with Mesa Airlines flying the Beech 1900 and DeHaviland DHC-8 airliners out of Denver, Colo. 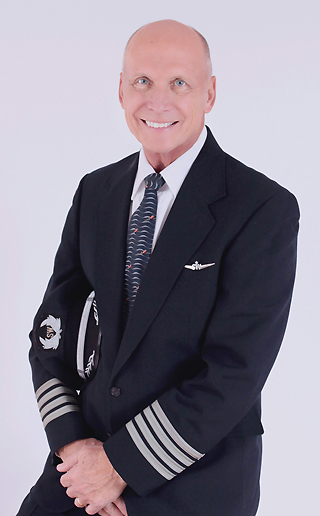 Hired by Southwest Airlines in 1998, Mike spent almost 17 years flying various models of the Boeing B-737 as First Officer and Captain out of Phoenix, Ariz., and Midway Airport in Chicago, Ill., and retired in 2014. Mike retired with 18,000 hours of flying time over a lifetime and enjoyed every minute in the air and on the ground. Mike spent his adult journey with the love of his life, Susan. They married immediately upon graduation from college and spent a blessed lifetime in a close and strong relationship with Jesus Christ and each other. They served faithfully in the many churches they were associated with over many moves. Mike served most recently as the Chairman of the Leadership Team at Community Covenant Church in Kearney, Mo. Beside Susan, Mike is survived by his mother, Marilyn Ruth of Colorado Springs, Colo.; his daughters and their families, Kelly and Ryan Klindt with grandchildren Nolan, Jared and Ainsley and Megan and Cody Hopkins with grandchildren Rowan and William; Michael’s siblings, Micki and Pat Mingus family of Castle Rock, Colo., Mark and Lisa Ruth family of Colorado Springs, Colo., Mindy and Cal Turner family of Colorado Springs, Colo., and Kim and Steve Nofel family of Colorado Springs, Colo.; Susan’s siblings, Drew and Connie Cannatella family of LaRose, La., and Rob and Pam Cannatella family of Cut Off, La. Memorial service will be held at 11:00 a.m. Saturday, May 12, 2018 at Kearney Community Covenant Church. Visitation will be from 9:30 to 11:00 a.m., prior to the service. In lieu of flowers, donations may be made to the church in Mike’s name. Mike was such a light. He will be greatly missed. To his family, I offer my heartfelt condolences and I pray for peace and comfort for you all. What an amazing family you are, what an amazing man he was. We are sorry for your loss. Hold your memories close and time will comfort you. God bless your family. Our prayers and thoughts are with the Mike’s family and friends. I didn’t know Mike except through stories from Mark, but reading about him and his life, he must have touched a lot of different people that are better for knowing him. May he rest in peace; he will be missed.